Forces aren’t just aligning against Donald Trump, they’re moving in on him in accelerating fashion. 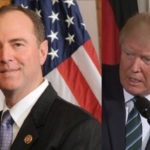 The results of multiple long-running criminal investigations into Trump and his crime family are finally beginning to become more clear, and the guy whom Trump once dubbed “Little Adam Schitt” is more than happy to pile on. Last night we learned that federal prosecutors for the Southern District of New York have subpoenaed the financial records for the Trump inauguration committee. That subpoena lists off a number of serious criminal charges including money laundering, wire fraud, and conspiracy against the United States. This is a preview of some of the charges that Trump and his family are about to get hit with. This prompted Donald Trump’s mouthpiece Sarah Huckabee Sanders to trot out her usual refrain whenever another Trump criminal scandals surfaces. She claimed that Trump’s inauguration crime spree somehow has nothing to do with Trump.